Precious metals expert Michael Ballanger assesses the gold-silver ratio and its ramifications for the market. I want to go on the record and state categorically that, in my opinion, technical analysis is of limited value when trying to predict the short-term movements of precious metals. However, there are millions of traders and investors out there who believe that it does work despite interventions, manipulations, and the ability of the bullion banks to fabricate a surrogate for actual physical gold by way of paper futures. 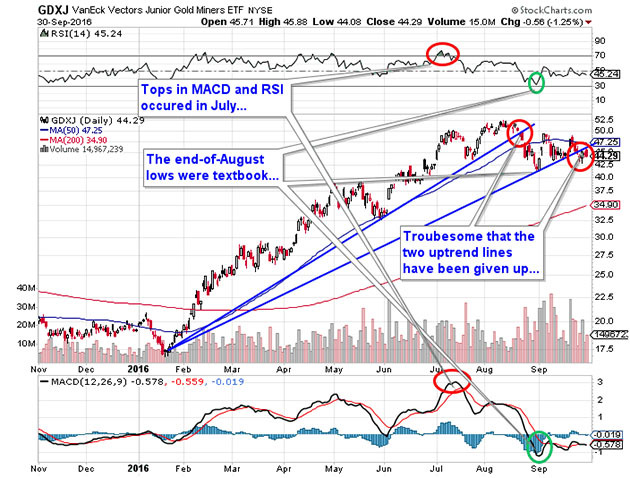 In light of that, the short-term technical set-ups for gold and silver and the miners are all different in that after Friday's month-end bombardment, which originated in the London options market, that formidable uptrend line that began in December 2015 has finally been vanquished. The ramifications could be nasty next week because for the second year in a row, the seasonally strong month of September failed to shine (at least for gold). The big question is now whether or not we get a follow-through to the 200-dma at $1,252 before resuming the uptrend or will that large Commercial short position serve as a demand catalyst and limit any meaningful downside? 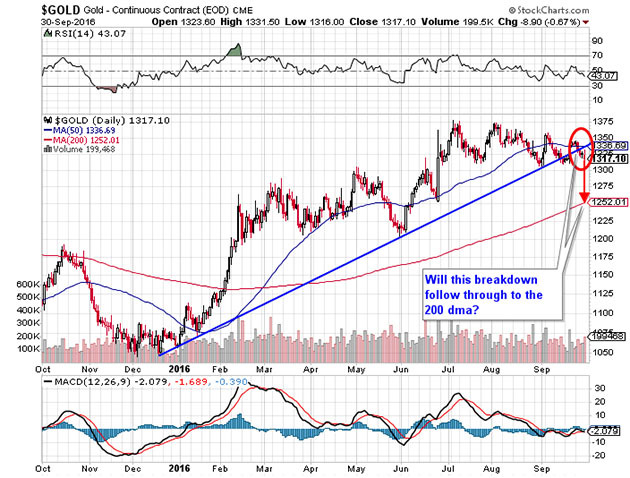 Unlike gold, the silver market is in great shape technically in that it has actually held its uptrend line dating back to the December lows and could actually pull back to $18.20–18.25 and still be intact bullishly. 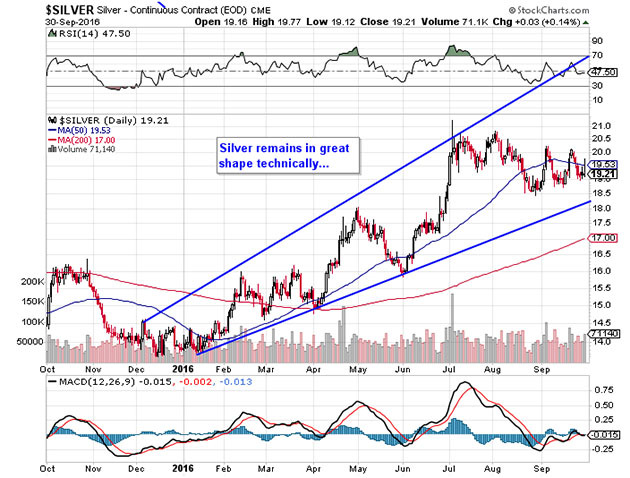 The fact that silver is outperforming gold is a bullish confirmation in my world. 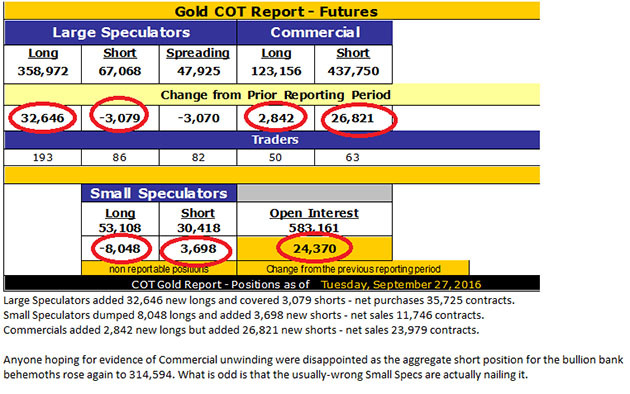 The Gold-to-Silver-Ratio (GTSR) continues in its downtrend, which I believe is explained by the enormous Commercial short position in silver, where one of two things are occurring. Either the big base metal miners have mobilized their byproduct silver reserves by way of the hedges or the bullion banks are playing games. Perhaps it is a combination of both as it wouldn't be a terribly brave trade for a desk trader to play "pile on" to a big base metal miner's orders. Or maybe, just maybe, the physical demand for silver is finally pulling away from the shenanigans that we have been dealing with for what seems like forever. 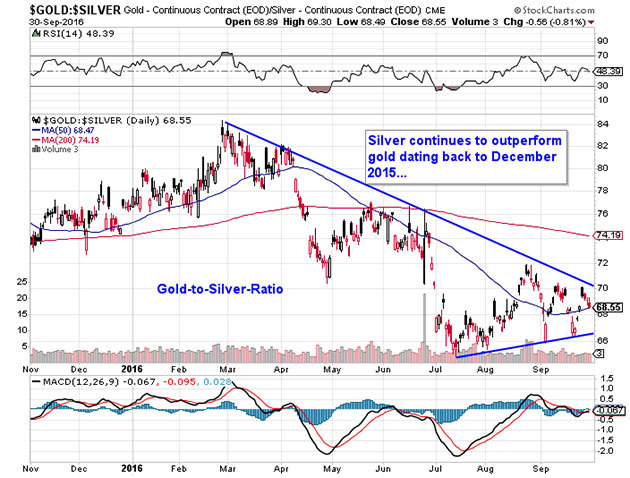 Any way you cut it, silver is outperforming gold and that usually means that both metals are headed higher. The Commercials appear to have been quite busy since the Federal Reserve abandoned the rate cut idea; they capped the post FOMC rally in gold at $1,340 and having closed the month of August at $1,311.40, September's closing settlement at $1,317.10 was a fairly anemic showing given that we just went through the best-performing month of the year. I don't bother posting the silver COT because it's always a JP Morgan slugfest riddled with little subtlety and an ample dollop of fraudulent activity. The miners have had a pretty stiff correction and actually closed out the month a tad better than one might have expected given the gold price action. I bought the GDXJ (VanEck Vectors Junior Gold Miners ETF) November $55 calls in mid-August (WAY too early) but then added the Nov $45 at the end, but the GDXJ calls are going to need a big move in the underlying ETF for me to pull a rabbit out of the hat. In fact, I am doubled up on the ETF and leveraged and I am offside about $4 per share on the non-core holding while the core bought in late 2015 is veritably free. As I spoke about in an earlier missive, I need to see the HUI (NYSE Arca Gold BUGS Index) hold 230 and the GDXJ must hold $41.76 (the end-of-August intraday low) or I will be forced to throw them overboard and replace the hedges lifted in mid-August. The U.S. political race, being about as ugly as one can ever recall, will surely have the US Dollar Index weaving back and forth all month and polls will surely be heeded closely. The Syrian situation is getting a tad hairy and the Deutsche Bank gong show continues to roil all markets with every sound bite emanating from the mouths of the ECB snapperheads. The GDXJ, representing the junior gold miners, has been a standout all year but I can't and won't let the big gains evaporate. I would rather get whipsawed on a reversal than sit by aimlessly while it heads down another 15% to the 200-dma. I'm using the $41.76 level as a point under which I will place the stop loss order ($41.50). Lastly, some of the biggest money made this year has been in the "penny dreadful," many of which came out of the gate with $0.05 and $0.10 financings and which have now become free-trading while up between 500% and 1,000% for the year. Unlike the mid-year hysteria that featured lithium stocks that screamed ahead with little fear of the oversupplied market nor the lack of fundamentals, the last month has seen sentiment cool substantially and the momentum trade which carried them in the first half has now begun to demand results and rationale for maintaining market capitalizations formerly reserved for producers or those with a 43-101 compliant resource. In summary, I head into Q4/2016 firmly in the bullish camp but mindful of the need to manage risk and temper enthusiasm until I can see signs that investors are regaining those animal spirits of earlier 2016 days. In my perfect world, the intermediate term objective for gold is a breakout through $1,400 and $25.45 silver, which assumes a GTSR of 55. 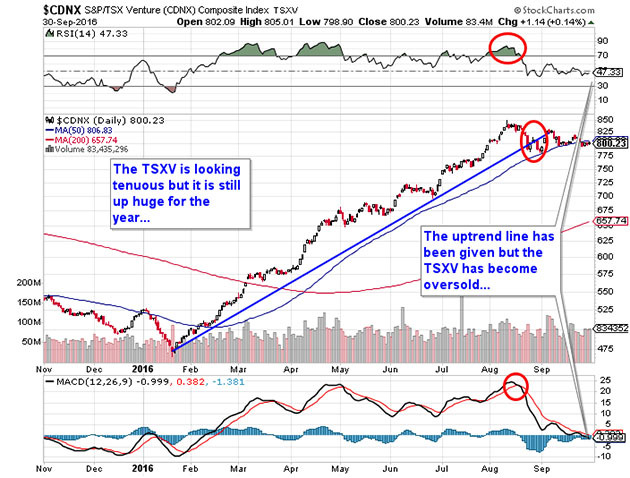 The long-term forecast implies a move equal in percentage to the move from $110 to $857 from 1976 to 1980 which was 6.79 times the low; using the December/2015 low of $1,045 and extrapolating a 6.79 X's move, I arrive at $7,095 per ounce gold with a silver price at 1/50 of gold or $142/ounce. Now, before you get all giddy and start transferring funds into your online trading accounts, I need to see a big volume reversal to the upside in the miners while those Commercial short positions get unwound into RISING prices. 1) The following companies mentioned in the article are sponsors of Streetwise Reports: None. The companies mentioned in this article were not involved in any aspect of the article preparation. Streetwise Reports does not accept stock in exchange for its services. The information provided above is for informational purposes only and is not a recommendation to buy or sell any security. 2) Michael Ballanger: I, or members of my immediate household or family, own shares of the following companies mentioned in this article: Santa Rosa Silver Mining Company. I personally am, or members of my immediate household or family are, paid by the following companies mentioned in this article: None. My company has a financial relationship with the following companies mentioned in this article: I provide consulting services and have received options indirectly through a company in which I am a part-owner. I also indirectly own shares and warrants in the RTO company, Santa Rosa Silver Mining Company, which will, assuming all regulatory approvals are met, be converted to Canuc on a 1:2 basis. I determined which companies would be included in this article based on my research and understanding of the sector. Why do I have a feeling this was written last week? Now what is your take on the downward preasures?